Description/Historical Information: Young female teacher, Miss Wagstaffe, with class of 27 young pupils [one more not shown] sitting on forms behind long tables under a tree. 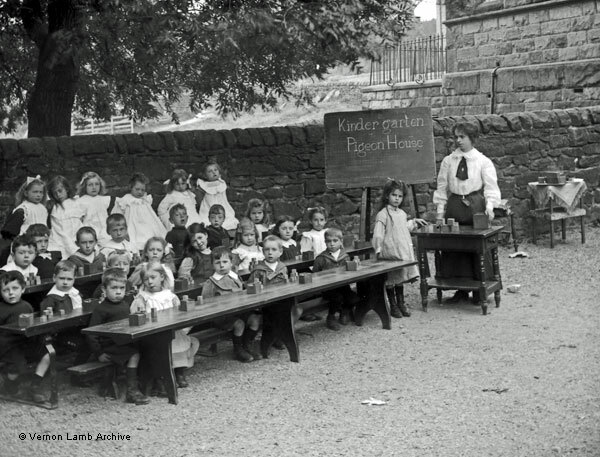 The words on the blackboard read Kindergarten, Pigeon House. They seem to be using wooden bricks which fitted into the small boxes that were on the table in front of each child [also see VLA5231 an VLA5237]. A postcard that shows the front of the school is elsewhere on this web site.